Shilpa Shetty, Raj Kundra and their son Viaan bid adieu to lord Ganesha on Friday evening to the beats of dhol. Shilpa, who looked beautiful in a light pink sari, happily danced to the beats with Raj and sister Shamita. They were joined by Shilpa's mom Sunanda Shetty, other family members and close friend for the Ganesh visarjan. Shilpa's blockbuster dance moves were clearly the highlight of the evening. Shilpa also Instagrammed a video from the visarjan and wrote, "This year, nothing gives me more joy than to welcome and now bid adieu to our eco-friendly Ganpati , knowing that he will bless us and become one with the earth now and therefore, continue to bless us in the purest way possible. This is the first time we immersed him in our front yard despite living right by the beach taking cognisance of the pollution in our environment." Take a look at Ganpati visarjan at Shilpa and Raj Kundra's home. 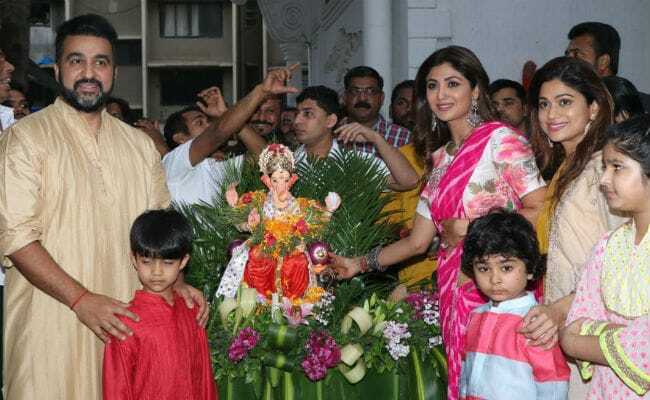 Shilpa, Raj and Viaan had welcomed Ganpati home on Wednesday. They celebrated the first day of Ganesh Chaturthi with a close-knit puja. Shilpa, Raj and Shamita shared posts from the Ganpati puja at their residence. "Om Shree Ganeshaya namah. Our Gannu raja is back! Happy Ganesh Chaturthi to my Instafam. May all the obstacles be removed and you all be blessed with success," wrote Shilpa Shetty. Shilpa Shetty and businessman Raj Kundra married in 2009. Viaan was born in 2012. 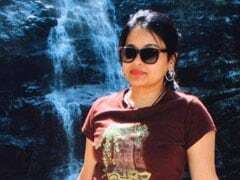 She is known for films like Baazigar, Dhadkan, Life In A... Metro and Apne<. She is also a yoga expert.